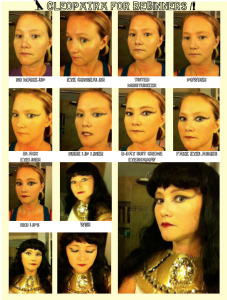 At any rate, here is a step-by-step guide to my makeup experiment. I’m hoping to invest in some makeup brushes soon, which will help with the application. Also, I should’ve sprung for a black eyeliner that wasn’t $0.99! Note: I don’t use mascara with fake lashes, but if you do, please make sure to apply before the lashes and let it fully dry.